The biggest challenge for a software developer: Absorbing the latest knowledge while simultaneously keeping clients happy. Where does the time go? Fortunately, when it comes to HTML5 and CSS3, a UK-based publisher has released a just-the-facts guide that may help. At 127 pages, the entire publication (they call it a bookazine) can be devoured in a single day. 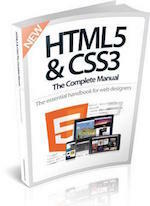 Imagine Publishing’s HTML5 & CSS3: The Complete Manual is well worth the time investment. Note: A version of this article also appears in the Book Reviews section of ChicagoRuby.org. One thing I like about this book: Nothing is assumed. All explanations are clearly presented from square one. The introduction even defines the terms hypertext and responsive design in words that could easily be hijacked for your next presentation to non-technical management. Personally, I appreciate the don’t-assume-anything definitions. I completed all of my formal computer science training in the last century, before we knew how far this Internet thing might go. Books like this help to fill in the gaps. Well done, authors! If you’re already current on HTML & CSS, the examples in the beginning of the book will be too easy for you. Skip ahead to the examples toward the end and work on those. The sections on responsive design, Bootstrap, and Foundation are especially useful. My British-speaking friends and I sometimes tease each other about variations in American vs UK spelling for certain words. “Colour” vs “color” and that sort of thing. This book uses UK conventions. I spotted a fair number of typos in the book’s code examples. Typos in human-readable text are no big deal. But a missing > or = in a book about HTML and CSS can make or break an example. Of course, we’re all human and typos are simply a fact of life. Suggestion for the publishers: Setup a GitHub repo with the code samples. That way, if typos in code are discovered (always certain because we’re human) the typos can be corrected and shared immediately. The bottom line: HTML5 & CSS3: The Complete Manual is worth reading, especially if you need a quick way to keep up with web trends.